"There’s a lot of really great teachers in the state," said Christie. "But their union cares more about how much they get paid than they care about how well you learn." That's why Jersey schools are short of supplies, according to Christie. It's so inconvenient for him to provide teachers with salaries that the only way he can make up for it is by pulling supplies from schools. After all, Christie long ago made sure taxes on the rich were cut, and that cost around a billion dollars. Yet those greedy teachers still won't agree to work gratis. Where is Governor Christie going to get funds to helicopter to his son's baseball games? Christie, of course, is always concerned with the taxpayer. That's why he killed the tunnel that was supposed to run from Jersey to New York. It turns out that he just lied about the whole darn thing, and now there's no tunnel, and it appears he deprived his state of it just to advance his up-and-coming political career. President Christie. 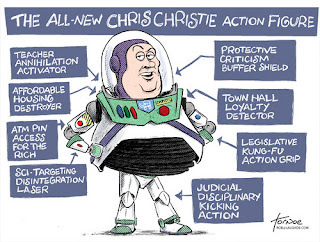 Emperor Christie. Whatever it takes. Still, teachers have to be careful what they say to students. It's kind of incredible the governor is not subject to such standards. This particular governor has no problem spouting outright falsehoods to his state, no matter what the cost. So lying to a bunch of teenagers, for him, is like stealing candy from a baby. And that's precisely what I expect to see Chris Chistie do next.